The IfM has contributed to the assessment of the medium-term economic and policy implications of new and emerging production technologies in the recently published OECD book Next Production Revolution: Implications for Governments and Business. Published in May 2017, Dr Eoin O’Sullivan, Director, Centre for Science, Technology and Innovation Policy (CSTI) and Dr Carlos López-Gómez, Head, Policy Links Unit, IfM ECS, authored the chapter ‘An international review of emerging manufacturing R&D priorities and policies for the next production revolution’. 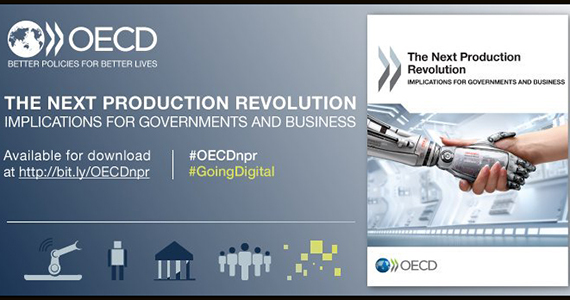 The OECD publication looks at the opportunities and challenges, for business and government, associated with technologies bringing about the “next production revolution”. This report sets out the emerging features of production across many technologies, from multiple policy standpoints and using different types of evidence and analysis. All technologies are developing rapidly, and as they transform the production and the distribution of goods and services, they will have far-reaching consequences for productivity, skills, income distribution, well-being and the environment. The more that governments and firms understand how production could develop in the near future, the better placed they will be to address the risks and reap the benefits. In their chapter, Dr O'Sullivan and Dr López-Gómez present a review of emerging trends in manufacturing research and development (R&D) relevant to the next production revolution. It is based on analysis of national government policies, foresight exercises and research strategies in selected OECD countries and other major economies. The review highlights growing attention to the themes of convergence (of research disciplines, technologies and systems), scale-up (of emerging technologies), and national economic value capture (from manufacturing innovation). These policy themes have in turn resulted in manufacturing research programmes and institutions adopting a broader range of innovation functions (beyond basic research), creating closer linkages between innovation system actors, and providing new types of innovation infrastructure (tools, enabling technologies and facilities). Case studies of selected initiatives illustrate the varieties of approaches and contexts across countries. The chapter aims to help inform discussion and stimulate debate about the design and management of manufacturing research institutions and programmes for the next production revolution. Download the Chapter 'An international review of emerging manufacturing R&D priorities and policies for the next production revolution' authored by Dr Eoin O’Sullivan, Director, (CSTI) and Dr Carlos López-Gómez, Head, Policy Links Unit, IfM ECS.